A process based management system approach has been adopted to help develop, implement and improve the effectiveness of the Quality Management System and to help ensure customer focus. 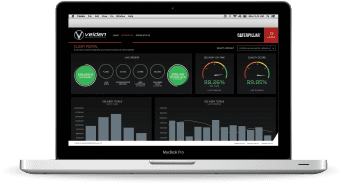 Velden aims to prevent problems within the process so that all output is accurate. Up-front preventive action is utilised to try to eliminate quality problems before they occur. 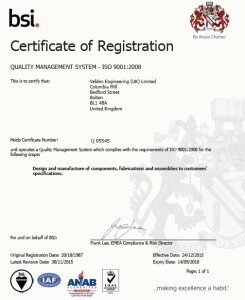 It is the established policy of Velden Engineering UK Ltd to provide it’s Customers products which are manufactured in accordance with the specification supplied, ‘fit for purpose’ and controlled via a Quality Assurance System to BS EN ISO 9001:2008. The policy operating within Velden Engineering involves every employee in a Total Quality way. We firmly believe in the concept that you ‘cannot inspect Quality into a product’ responsibility for Quality rests with each and every individual to achieve the performance standards required to satisfy the Customer. The Quality of our products and services result from the teamwork and contribution of all functions within the organisation. Continual search for improvement, not just methods, products and processes, the Quality of the service, procedures and relationships making the commitment to putting Quality first, to Total Quality – a way of life. In our business the customer is king, we have an absolute commitment to Customer focus and never forget they are the lifeblood of our organisation and the purpose of our existence. Velden’s top management team are empowered to ensure resources are well maintained and available, all policies, procedures, work instructions, flowcharts & control plans relating to the Quality Management System are communicated, understood, enforced as laid down, reviewed and continuously improved. "Our Quality mission is to delight all our customers by satisfying their needs and requirements, right first time, on time, every time." We supply additional quality documentation and data to customer specific requirements. Velden has invested in the very latest inspection equipment to ensure quality standards are maintained and reduce the time required to inspect parts. Velden has invested in the very latest portable inspection equipment to ensure quality standards are maintained and time required to inspect parts is reduced.